The global ink additives market was valued at US$ 2.2 Bn in 2017 and is anticipated to expand at a CAGR of more than 5.0% from 2018 to 2026, according to a new research report published by Transparency Market Research (TMR) titled ‘Ink Additives Market – Global Industry Analysis, Size, Share, Growth, Trends, and Forecast, 2018–2026.’ Printing ink manufacturers use ink additives as raw materials to impart various characteristics to printing inks. These characteristics include different viscosities, thicknesses, resistance to the environment, and smooth running on the printing press. All goods require packaging. Packaging is an important factor influencing the purchasing decision of consumers. Packaging protects goods from incorrect handling, harsh environments, and transportation. Attractive packaging plays an important role in selling of goods. Manufacturers as well as consumers have started realizing these benefits of packaging. As a result, the global packaging industry has expanded at a considerable pace in recent years. The trend is expected to continue during the forecast period. All types of packaging require printing inks and all printing inks require ink additives as one of the raw materials. Thus, increased awareness regarding packaging is expected to drive the global ink additives market during the forecast period. Digitization refers to the development of text and pictures in the digital form. Development of computers, smartphones, and high-speed Internet has accelerated the digitization process. Several textbooks, novels, illustrative books, etc. are currently available on the Internet. Even marketing campaigns no longer require printing of any materials and they can be conducted entirely online. The trend of e-commerce is growing at a rapid pace across the world. Digitization across several sectors, such as e-commerce, books, and marketing, has hampered the publication & commercial printing industry. In turn, substantial decrease in paper-based communication is likely to restrain the global ink additives market during the forecast period. Various types of ink additives are available in the market. They include surfactants, waxes, defoamers, and dispersants. They offer different end-results. For example, surfactants improve the wetting of pigments or substrates; waxes promote rub resistance; and plasticizers enhance the flexibility of printed films. Ink additives can be manufactured according to the precise requirement in terms of the final printing ink. Ink additives can even be customized for specific applications, such as packaging, publishing, and commercial printing, or printing processes such as lithography, flexography, gravure, and digital printing. However, development of custom ink additives is only possible through close collaboration between printing ink manufacturers and ink additive manufacturers. Such collaborations present lucrative opportunities for ink additive manufacturers. In terms of type, the global ink additives market has been segmented into wetting agents, rheology modifiers, and others, with the wetting agents segment accounting for a prominent share of the market. Dispersants and defoamers are leading sub-types of wetting agents, with the dispersants sub-segment accounting for a leading market share. The wide range of properties imparted to printing inks by wetting agents have led to the wetting agents segment gaining a major share of the global ink additives market. Based on printing process, the market has been segregated into lithography, flexography, gravure, digital, and others. The flexography segment holds a key share of the market, primarily because the flexographic printing is widely employed in end-user industries such as packaging. In terms of printing ink, the global ink additives market has been segmented into water-based, solvent-based, and UV-cured. A large share of ink additives is consumed by solvent-based printing inks. In terms of application, the market has been segregated into packaging, publishing, commercial printing, and others. Packaging is the primary application of ink additives. Furthermore, with rising awareness regarding significance of packaging, share of the packaging segment in the global ink additives market is expected to increase in the near future. In terms of region, the global ink additives market has been divided into North America (the U.S. and Canada), Latin America (Brazil, Mexico, and Rest of Latin America), Europe (Germany, the U.K., France, Italy, Spain, Russia & CIS, and Rest of Europe), Asia Pacific (China, India, Japan, ASEAN, and Rest of Asia Pacific), and Middle East & Africa (GCC, South Africa, and Rest of Middle East & Africa). Asia Pacific is the leading consumer of ink additives, due to the large amount of printing ink production taking place in the region. 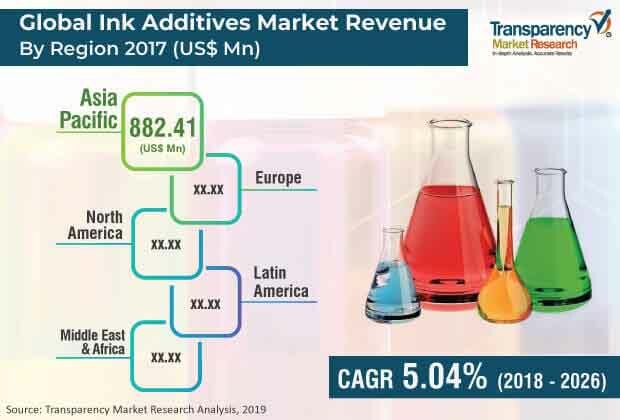 Ink additives is a moderately consolidated market with the presence of a few key multinational players such as BASF SE, The Dow Chemicals Company, Evonik Industries, and Altana AG. It is also a mature market with the presence of established players. This makes entry of new companies relatively difficult. Several large companies in the market have adopted the strategy of new product development to compete effectively in the market. For example, Evonik Industries has obtained access to innovative technologies through its corporate venture capital activities.